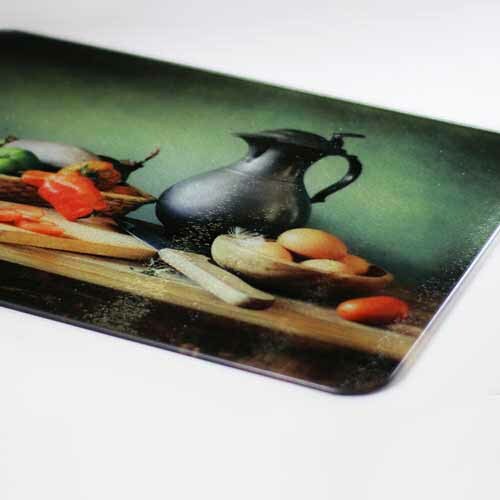 Cutting boards made from tempered textured chinchilla finish glass with your artwork or photography printed on them. Includes optional rubber bumper pads that can be placed on the bottom to keep cutting board from sliding. Dishwasher safe however for maximum life of the imaged product, we recommend hand washing. Custom print your artwork or photography online on one of these items. Order them for yourself or have them drop shipped to your customer under your brand. Recommended Image Dimensions: 15.75 x 11.81"
15.75" x 11.81" x .196". 30mm corners. Tempered Textured Chinchilla Finish glass. Recommended Image Dimensions: 11.81 x 11.81"
11.81" diameter" x .196". Tempered Textured Chinchilla Finish glass. Recommended Image Dimensions: 11.81 x 7.87"
11.81" x 7.87" x .196". 30mm corners. Tempered Textured Chinchilla Finish glass. Recommended Image Dimensions: 7.87 x 7.87"
7.87" diameter" x .196". Tempered Textured Chinchilla Finish glass.